"...earns sia la mia ammirazione che il mio rispetto -- both my admiration and my respect." Sound "Silky, glowing sound, with more tonal elegance than just about any digital source around. In particular, the CDP-7T/Mk III reproduced massed strings as well as any source Ive heard short of LP." "Bass was deep and powerful. It wasnt boomy or mushy, either." Features "A two-piece Italian-made CD player with a separate power supply," "the CDP-7T/Mk III uses 24-bit Burr-Brown PCM1704 DACs, an upgrade from the Mk IIs 20-bit DACs. The zero-feedback analog section of the player uses a pair of ECC81 tubes -- or 12AT7s in American terminology." "Inside 26 1/2-pound main chassis are the custom-made top-loading mechanism and all of the audio circuit boards." Use The remote control "lacks some features common for even sub-$100 players, like a number pad for direct track access." "The front-panel display of the CDP-7T/Mk III is huge, so even someone with my poor vision can easily see track and time information from across the room." Value "The Lector CDP-7T/Mk III is not only the best-sounding CD player Ive heard at its mid-level price point, but one of the best CD players Ive heard, period." 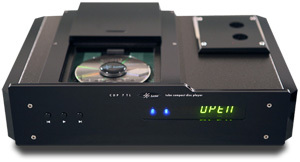 The $4490 USD Lector CDP-7T/Mk III is a two-piece Italian-made CD player with a separate power supply connected by a two-meter umbilical. Both chassis are finished in black Plexiglas and aluminum, with black-Plexiglas side panels. Made from thick acrylic, the front panel of the player has a small step along the top edge, which is quite distinctive. The CDP-7T/Mk III is very sleek, very black, and very elegant. It lived up to my expectations for how a CD player made in Italy should look. Inside the 26 1/2-pound main chassis are the custom-made top-loading mechanism and all of the audio circuit boards. A magnetic puck clamps the CD to the drive spindle. Top-shelf placement makes inserting and removing CDs easier, but the 17 1/4"W by 12 1/8"D by 3 1/2"H main unit fit easily onto an internal shelf of my equipment rack, with 7 1/2" of clearance providing sufficient room to insert and remove CDs. The power supply was small enough -- 8"W x 12 1/8"L x 3 1/2"H -- to possibly share shelf space with other small components. Because the power-supply chassis is smaller than that of the player and you need access to the top of the player, stacking isn't possible. The CDP-7T/Mk III uses 24-bit Burr-Brown PCM1704 DACs, an upgrade from the Mk IIs 20-bit DACs. The zero-feedback analog section of the player uses a pair of ECC81 tubes -- or 12AT7s in American terminology. That tube is plentiful, and because its not nearly as popular as, say, the 12AX7, tube rollers can still find decent new-old-stock 12AT7s at reasonable prices. The stock tubes are Chelmer Valve 12AT7s, which are rebranded late-model Mullards, but the review unit came with RCA triple-mica black-plate tubes. On the rear panel are RCA analog outputs and an S/PDIF RCA digital output. There are no balanced XLR or optical digital outputs. If youre not going to use the digital output, Lector provides a loading plug to terminate it. The CDP-7T/Mk III doesnt have a fully balanced circuit, so there are no balanced outputs. If you need them, they are available as an option, but that involves adding more circuitry. The player's output impedance is 150 ohms, low enough so that the CDP-7T/Mk III should drive virtually any preamp or integrated amp without issue. It had no trouble with the NuForce P-9 preamp, which has a lowish 10k-ohm input impedance. The CDP-7T/Mk III has its share of functional quirks. Only three buttons appear on the front panel: previous track, play, and next track. I like minimalist design, but where are the stop and pause buttons? Those are pretty essential, after all. Eventually I realized that the drawer lid served as the stop button. If you open it, the disc stops. I still prefer a real stop button, but oh well. A plastic remote control provides a more complete set of controls, including stop and pause. Its very positive in operation, but it lacks some features common for even sub-$100 players, like a number pad for direct track access. When I inquired about this, I was told that the CDP-7T/Mk III was designed "for sound quality," which direct access would have somehow compromised. Lector suggested using the previous and next buttons, but when you want to play track 26 of a CD with 50 tracks, this becomes a minor pain. The CDP-7T/Mk III played every commercial CD without issue, but it had trouble with several other discs. It refused to play the CD layer of one Tudor hybrid SACD, although it had no trouble with lots of other hybrid SACDs. While it read all the silver CD-Rs I tried, it refused to play one black CD-R, and it absolutely refused to play any CD-R that used dark-blue Azo dye. If you encounter a problem disc, you may want to pop it into your computer and copy it to a silver CD-R. That should be an easy workaround. The front-panel display of the CDP-7T/Mk III is huge, so even someone with my poor vision can easily see track and time information from across the room. Also on the front panel are two blue LEDs indicating when the power to the digital and analog sections is on. Separate switches on the front of the power supply let you turn power on and off to each section independently. Why would you want to do that? Well, the analog section uses two tubes, and if you want to extend their useful lives, you could turn them off while leaving the digital section powered up. Theres also a master power switch that turns both sections on and off. You cant dim the front-panel display with the remote, but there is a switch in the back of the player that turns the display off completely, but it also turns off the remote. Odd. In case you're wondering, I could tell no difference in sound when the display was on or off. The main unit of the CDP-7T/Mk III rests on three feet made of aluminum discs with rubber dimples inside them. The rubber dimples are not concentric with the round aluminum feet, but are offset to one side. According to the literature, you can replace the rubber dimples with aluminum cones that screw into the aluminum discs. Using three feet instead of four means the player will not rock back and forth or side to side. The CDP-7T/Mk III's manual is written in Italian and English, and although the latter is clearly not the writers primary language, the manual is still understandable. I suspect the manual may have been written for an earlier version of the player, because the specifications in it differed from those on Lector's website. But the operating procedures are the same, so I suggest reading the manual before using the player. The CDP-7T/Mk III's power cord is a nondescript number that looks a little heavier than a computer power cord. Brian Ackerman of Aaudio Imports, Lector's US distributor, encouraged me to try other power cords, and even sent an $1100 Isoclean Focus cord to try. My comments in this review are based on using the stock power cord, but see my sidebar on the Isoclean Focus power cord for further discussion. To gain a quick appreciation for the CDP-7T/Mk IIIs sound, just play a well-recorded CD of orchestral music, like Franz Schubert Symphonie No. 8 [Tudor 7144]. Youll be rewarded with a silky, glowing sound, with more tonal elegance than just about any digital source around. In particular, the CDP-7T/Mk III reproduced massed strings as well as any source Ive heard short of LP. Other instruments were not slighted, either. There was always plenty of detail, although it was not achieved by goosing up the high frequencies. The CDP-7T/Mk III made many other CD players sound tonally threadbare. Its no stretch to say the CDP-7T/Mk III surpasses every CD player Ive heard in terms of fullness and tonal accuracy. Loudspeakers  Second ReTHM, Opera Audio Consonance M12. Power amplifiers  Art Audio PX 25 stereo amp, Wright Sound Company WPA3.5 mono amps. Preamplifier  deHavilland Mercury 2, NuForce P-9. Interconnects  Crystal Cable CrystalConnect Piccolo, Dual Connect DC-I100, Purist Audio Design Venustas, DNM/Reson TSC. Speaker cables  Crystal Cable CrystalSpeak Micro, Dual Connect DC-S200, Purist Audio Design Venustas, Blue Marble Audio speaker cables. Power cords  Purist Audio Design Venustas, Blue Marble Audio Lightning, Isoclean Focus. The CDP-7T/Mk III exhibited very good frequency extension. Sometimes tube output sections have wimpy bass, but the CDP-7T/Mk IIIs bass was deep and powerful. It wasnt boomy or mushy, either. It had plenty of detail and impact, and it provided a solid foundation for the rest of the musical structure. During the review period, I had an opportunity to hear the CDP-7T/Mk III in a system with much deeper bass response than mine. This system had a Belles 28A preamp, Belles MB-01 mono amps, and Usher CP-8571 speakers. I was blown away (almost literally) by the subterranean, floor-shaking bass from the Usher speakers 8" woofers. I could literally feel the vibrations as much as hear them. One selection I played claimed a response to 16Hz, and while Im not sure the system reached that frequency, it was clearly in the low-20Hz range. So the CDP-7T/Mk III is capable of much deeper bass than my system can reproduce -- amazing for a CD player that uses tubes. Moving to the other end of the frequency spectrum, I suspect that, given my description of instrumental sonorities, you wouldnt expect high frequencies to be peaky or etched, and they arent. My usual high-frequency test cut, Jennifer Warnes "The Panther" from the CD layer of The Well SACD [Cisco SCD 2034], was slightly subdued in the treble through my reference deHavilland tube preamp, so the colorful percussion sounds that punctuate this piece were partly missing. However, when I replaced the deHavilland preamp with the very interesting solid-state NuForce P-9, the highs were more extended, and were, in fact, superb. I think the NuForce preamp is more sonically truthful. It also showed that the CDP-7T/Mk III had deeper bass than the deHavilland preamp could reveal. Soundstaging, the ability to depict the unique area in which the musicians perform and their spatial relationships to each other, was another strength of the CDP-7T/Mk III. On the Tallis Scholars recording of Allegris "Miserere," from their CD Allegri Miserere [Gimell 454 939-2], the two choral groups sounded unusually smooth; the solo group, which is located some distance behind the main group in the large church where the recording was made, was easily distinguished as being more distant. Horizontal spread was also noteworthy, with the singers distributed realistically across the soundstage. All in all, the CDP-7T/Mk III created a believable, three-dimensional sonic picture of the two choirs performing this work. A factor that makes a component emotionally involving and exciting for me is a deft handling of the entire dynamic spectrum -- from the small, microdynamic changes in volume to the large swings at the macrodynamic end of the scale. With the CDP-7T/Mk III, dynamics were complete but not over-emphasized. Actually, until I put my reviewers hat on, I never really thought about the CDP-7T/Mk IIIs dynamic prowess, so natural was it. Having toured Italy last year, I can personally attest that its truly a land of song; and the Lector CDP-7T/Mk III reflects that heritage. It seemed especially appropriate to listen to some Italian music through the CDP-7T/Mk III, so I cued up Cecilia Bartolis Live in Italy [London 289 455 981-2]. Although this CD does not sport audiophile-grade sound, the CDP-7T/Mk III fully revealed Bartolis jaw-dropping vocal technique. On Vivaldis "Agitata da due venti," the CDP-7T/Mk III presented Bartolis phenomenal breath control as she effortlessly (well, it sounded effortless, but it probably wasnt) ripped off a fusillade of staccato 16th notes. It was easy to hear how she attacked and released each note. On the other end of the vocal spectrum, and from another part of the world, the detailed nuances of Chris Joness expressive baritone on the album Roadhouses and Automobiles [Stockfisch SFR357.6027.2] came through clearly, with a full tonal presentation that enhanced the emotional and intellectual impact of these original songs. A CD player that can do all that earns sia la mia ammirazione che il mio rispetto -- both my admiration and my respect. My vintage Meridian 508.24 CD player ($3995 when still available) has been part of my reference system longer than any other component except my Linn turntable, and its fair to say that the rest of my system has been chosen to sound good with the 508.24. Other worthy CD players have challenged the Meridian for rack space, and some have bettered it in one or two areas. None, however, has totally surpassed it, which explains why it's still here years after it has been discontinued. The 508.24 has both unbalanced and balanced outputs, and both coaxial and optical digital outputs. Its remote control is functionally the best Ive used, although not the fanciest. The 508.24 has never refused to play any CD-R or the CD layer of any hybrid SACD. It wont play MP3 files, but were talking about hi-fi here, so who cares? The $1100 Focus falls in the middle of Isocleans power-cord line. Its substantial, built from high-quality components. Although fairly thick, its quite flexible, so its easy to maneuver to accommodate the orientation of your component's IEC receptacle. It wasnt hard to identify the improvements the Focus power cord made with the Lector CDP-7T/Mk III. When I played one of my bass-evaluation cuts, Jennifer Warnes "Way Down Deep" from The Hunter CD [Private Music 01005-82089-2], the intricate drum part had more detail, and the low frequencies went even lower. The background seemed quieter as well, so I heard more detail throughout the musical spectrum. As a result, the vocal line was more intelligible and easier to follow. Warnes voice seemed better fleshed out and more dynamic, whereas with the stock power cord the voice sounded more mechanical. On the cut "Allegri: Miserere," the sound was even more spacious than with the stock cord. Choral sections were better localized in space, and the voices were clearer and easier to understand. The solo group, placed well behind the main group, was more distinctly localized, and the solo voices were much easier to follow and understand. While the CDP-7T/Mk III is superb, it sounds even better with the Isoclean Focus power cord. Although $1100 isnt chicken feed, the Isoclean Focus was a worthwhile upgrade to the Lector CDP-7T/Mk III. I dont know how you could effect equal improvement by spending a similar amount of money elsewhere. The 508.24 clearly has more pace and low-end slam than the CDP-7T/Mk III, giving the music more rhythmic life and vitality. In no way do I mean to imply that the Lector player was slow or sluggish, just that the Meridian sounded somewhat more forceful. Nor is the 508.24 at all lacking in its ability to portray correct instrumental tonality and resolve texture; its just that the CDP-7T/Mk III is particularly strong in that area. The 508.24 has slightly more extended high frequencies through the deHavilland preamp, reproducing more of the high percussion parts on "The Panther." Through the NuForce 9 preamp, the CDP-7T/Mk III had stronger highs. The Meridian player sounded about the same into both preamps. I might think this difference was due to the lower input impedance of the deHavilland preamp, but its input impedance is 50k ohms, while the NuForces is quite a bit lower at 10k ohms. I used identical low-capacitance interconnects for both players, so they shouldnt have made a difference either. The Meridian CD player also had a smidgen more low-end weight, although the CDP-7T/Mk III certainly doesnt lack bass. Although the 508.24 produced excellent instrumental tonality, compared to the CDP-7T/Mk III it sounded a little mechanical when reproducing strings -- the first time thats happened. Both players created a spacious soundstage, but I would still give a slight nod to the CDP-7T/Mk III. If the CDP-7T/Mk III is the embodiment of Italian sound, with a focus on tonal beauty, the Meridian 508.24 might be considered the embodiment of English sound, with its more rhythmic presentation. In which country do your musical tastes reside? Remember when it was standard practice to bash CD playback for the lousy way it reproduced strings? Well, if you listen to a lot of music with massed strings, you really ought to find a way to hear how the CDP-7T/Mk III reproduces it. Unusually truthful timbres and spacious soundstaging await you, along with instruments that sound uncannily real. The high frequencies may be restrained a smidgen with some preamps, but not enough to affect the overall performance of the CDP-7T/Mk III significantly, which seemed to be about savoring beautiful sonorities rather than producing forward momentum. For many of the classical music selections I enjoy, thats a more than acceptable trade-off. The Lector CDP-7T/Mk III is not only the best-sounding CD player Ive heard at its mid-level price point, but one of the best CD players Ive heard, period. In fact, it sounds better than most SACD playback I've heard in areas where SACDs traditional strengths lie: bass response and tonal sophistication. Not having heard many significantly higher-priced digital players, I cant say if the Lector player betters them, but any way I look at it, the CDP-7T/Mk III is one superb CD player, and one I would certainly buy.